MULTICOMPONENT DIETARY SUPPLEMENT “VITAFIL LUX” MANIFESTS ANTI-INFLAMMATORY AND ANTIOXIDANT EFFECTS AND INCREASES OXYGEN CONSUMPTION IN COURSE OF EXPERIMENTAL PNEUMONIA IN RATS. The multi-component dietary supplement, Vitaphil Lux (VL), contains extracts of 19 medicinal plants traditionally used as anti-inflammatory remedies. 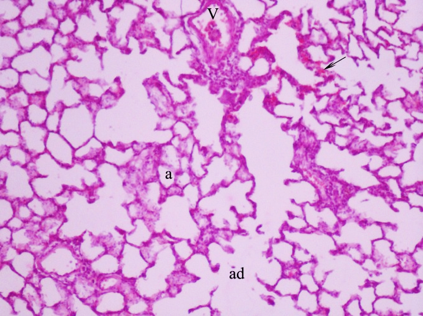 Here we have investigated the effects of VL on lung tissue morphology, ROS generation in blood, lung tissue and liver tissue homogenates, pro-inflammatory cytokine expression (TNF-α, IL6) and respiratory parameters (V˙E, V˙o2 and V˙co2) during experimentally induced pneumonia (i/p lipopolysaccharides (LPS) injection, 2 mg/kg) in rats. Endotoxemia was associated with: (1) pathological changes in lung morphology; (2) increased ROS generation; and (3) a gradual decrease of V˙O2 and V˙e. VL treatment of rats with pneumonia created positive changes in diminishing lung tissue injury, decreasing ROS generation in blood, lung and liver tissue and decreasing pro-inflammatory cytokine expression of TNF-α and Il-6. Oxygen consumption and carbon dioxide elimination in this group was increased compared to the LPS pneumonia group. Results of VL treatment of intact animals was mixed: 1) positive – significant augmentation of V˙o2 and V˙e; 2) negative – significant augmentation of ROS production in lung tissue. VL manifested promising therapeutic effects in the course of experimental pneumonia. Further research is needed to clarify the mechanisms of its action and the possible applications in clinical medicine. VL оказал многообещающие терапевтические эффекты в ходе экспериментальной пневмонии. Необходимы дальнейшие исследования, чтобы прояснить механизмы его действия и возможные применения в клинической медицине. Antibiotic administration in inflammatory disease treatment is often associated with drug resistance  and toxicity [2, 3]. Thus discovering active natural (homeopathic) drugs with minimal toxicity, no habituation and positive results on reducing the pathology is a valuable goal for research in medical pharmacology. We created a multi-compositional dietary supplement Vitaphil Lux (technical specification of Ukraine 15.8-32490422-005:2010) (VL), which contains extracts of 19 medicinal plants traditionally used as anti-inflammatory remedies. We included plants known to be powerful antioxidants, as well as ones that suppress expression of pro-inflammatory cytokines. The inflammatory process, especially in the lungs, is associated with a deficiency of ATP. We included components that stimulate glucose transport into the cell and activate mitochondrial work to optimize recovery during complex anti-inflammatory treatment. The anti-inflammatory effects of VL components are at least partly, related to their antioxidant properties, since free radical oxidation products stimulate the expression of pro-inflammatory cytokines. Diminished cytokine-induced neutrophil chemo attractants, IL-1β, IL-6, and TNF-α have been described using extracts and active components of Tanacetum vulgare [15, 16, 17, 18], Rheum tanguticum maxim , Recuitta chamomile , Potentilla anserine L. , Valeriana officinalis . Extract of Inula helenium manifests radical-independent inhibition of the nuclear factor-κB pathway, caused by suppression of the phosphorylation of Syk kinase [21, 22]). Besides anti-inflammatory and antioxidant properties some components of VL are shown to increase cellular glucose uptake and mitochondrial activity. Increased levels of peroxisome proliferator-activated receptors γ2 and reactivation of insulin-mediated phosphorylation of phosphatidyl inositide 3-kinases and AMP-activated protein kinase were described as an effect from extract introduction of 3 items; Inula helenium [23, 24], Recuitta chamomile  and Liquorice . Adenosine monophosphate activated protein kinase was shown to regulate diverse metabolic pathways and to increase mitochondrial activity . An increase of mitochondrial enzyme activity occurred with extracts of Potentilla anserine L..
Three other plants used in VL improve incretin secretion and, hence, insulin synthesis, and show a hypoglycemic activity; Helichrysum arenarium L. Moench, Anethum graveolens L [8, 9, 11] and Melissa officinalis . In this study we investigated the influence of VL on lung tissue morphology, reactive oxygen species (ROS) generation in blood, lung-and liver- tissue homogenates, pro-inflammatory cytokines expression (TNFa, IL6) and respiratory parameters (expired volume of ventilation per minute (V˙E), rate of oxygen uptake andamount of carbon dioxide eliminated per minute (V˙o2, V˙co2)) as we followed the course of our experimental rat pneumonia. The study protocol was approved by the Animal Care Ethics Committee of Bogomoletz Institute of Physiology, Kyiv, Ukraine. Male Wistar rats were maintained in a 12;12 h light:dark cycle, with a temperature of 22±3°C. Food and water were available ad libitum. 2.1 VL composition and preparation. Fifty grams of Ledum palustre L.; 50 g of Helichrysum italicum L.; 30 g of Helichrysum arenarium L.; 50 g of Betonica officinalis L.; 25 g of Valerianaofficinalis L.; 15 g of Calluna vulgaris L Hill;50 g of Inula helenium L.; 35 g of Iris pseudaсorus L.; 50 g of Atropa belladonna L.; 50g of Potentilla anserine L.; 50 g of Melissa officinalis L.; 50 g of Capsella bursa-pastoris L.; 50g of Tanacetum vulgare L.; 45 g of Artemisia vulgaris L.; 50 g of Rheum tanguticum maxim. ; 50 g of Chamomilla recutita L. Rauschert (Matricaria chamomillaL. ); 30 g of Glycyrrhizia glabra L.; 30,0 g of Anethum graveolens L.; 25 g of Salvia officinalis L. were dried to 20% humidity, mixed and soak in a mixture of 1000g of molasses, with 1000 g of ethanol at 15 oC, 60% humidity for 7 days. Then 500 ml of distilled water was added to the mixture and heated to 50 ° C for 90 minutes, then cooled and filtered. We have chosen pneumonia induced by lipopolysaccharides (LPS) specific to the cell membrane of E. coli as the model for our study. The presence of these structures in the tissues is recognized by the immune system as bacterial invasion which initiates an inflammation cascade. In our experiment LPS was administered via intraperitoneal (i.p) injection. Pneumonia formed in this way is accompanied by sepsis [28-32]. Rats were injected i.p. with 2 mg/kg of LPS (Escherichia coli055:B5; Sigma, St. Louis, MO, USA) dissolved in physiological saline, to induce endotoxemia and lung inflammation. Controls were injected with sterile saline alone. Thirty-two Wistar 6 month old male rats, weighting 270-350 g, were divided into four groups of 8 rats each: (1) control, (2) experimental pneumonia, (3) experimental pneumonia treated with VL, and (4) VL treatment of intact animals. Animals of all groups were euthanized 72 h after pneumonia induction (LPS injection) and tissue samples were immediately collected. The parameters of pulmonary ventilation and gas exchange were measured five times using respiratory masks fitted to conscious animals as follows: (1)before LPS injection, (2) time zero, (3, 4, and 5) 24, 48 and 72 h after LPS injection. In control and healthy VL treated groups, pulmonary ventilation and gas exchange were both measured at these times with no additional treatment.Five hundredths (0.05) ml of VL diluted in sterile water (1:5) was administered 7 times during the study with an orogastric catheter: first at time zero (for the group with pneumonia it was immediately prior to injection of LPS), and then every12 hours. All tissues were collected in 2-4 mm blocks, fixed in 10% neutral buffered formalin for 24-48 hours, dehydrated, cleared and embedded in paraffin. Four to five µm sections were stained with hematoxylin and eosin (H&E) and evaluated with light microscopy (Scope: Nikon, Eclipse E-200; camera Nikon, ds-FI1) at 200, 400 and 1,000x for morphological characteristics. Morphometric analysis was performed for samples of four rats from each group. H&E sections were, conventionally divided into sectors, followed by a random fixation of images analyzed by the software Image J. We analyzed the following parameters:1) relative volume of alveolar space; 2) relative volume of alveolar septa; 3) relative volume of hemorrhagic infiltration; 4) relative volume of granulomas; and 5). the relative volume of atelectasis. Results were expressed as a percentage relative to the total volume of each slice of tissue sample. Generation of reactive oxygen species (ROS) in blood plasma and lung tissue homogenate was measured by means of lucigenin- and luminol-enhancedchemiluminescence(ChL). After decapitation blood was gathered in heparinized tubes and the ChL essay immediately ensued. N-grams of lung tissue were homogenized on ice in a Potter-Elvehjem tissue grinder with 5 volumes (w/v) of Hanks’ balanced salt solution (HBSS). Samples for ChLmeasurement contained the following ingredients in a total volume of 1 mL: 0.9 mL of whole blood or lung tissue homogenate; and 0.1 mL of 50 µM lucigenin or 0.1 mL of 20 µM luminol for the final concentration.After 3-5 min of spontaneous chemiluminescence 0.1 mL of HBSS with 0.1 μg of opsonized zymosan (30 min incubation with rat serum at 37°C) was added to enhance chemiluminescence. Then ChL was monitored for 15 min (Luminometer ЕА-1, Ukraine)at 37°C with continuous mixing. We evaluated:1) the light signalsum (S)for 10 min at a sampling frequency of 0.25 Hz, which was calculated and expressed as relative light units; 2) maximum light signal after ChL enhancement (Imax), expressed as relative light units; and 3) minimal light signal after ChL enhancement (Imin), expressed as relative light units. Generation of reactive oxygen species (ROS) in liver tissue homogenate was measured by means of ChL with the Fenton reaction (2 mMFe2+, 8.8 mM H2O2 at pH 7.4).Liver tissue was homogenized on ice in a Potter-Elvehjem tissue grinder with 5 volumes (w/v) of HBSS. Samples for ChL measurement contained the following ingredients in a total volume of 1 mL: 1) 0.5 mL liver tissue homogenate; 2) 0.4 mL of the Fe2+ solution; and 3) 0.1 mL of H2O2. Hydrogen peroxide was added last followed by recording luminescence. ChL was then monitored for 5 min (Luminometer ЕА-1, Ukraine) at 37°C with continuous mixing..
2.6 RNA isolation, reverse transcription, and real-time polymerase-chain reaction. Total RNA was isolated from lungs using the Trizol RNA-prep kit (Isogen, Russian Federation) per the manufacturer’s protocol. RNA concentration was determined using a NanoDrop spectrophotometer ND1000 (NanoDrop Technologies Inc, USA). Reverse transcription was performed using a RevertAidTM H Minus First Strand cDNA Synthesis Kit (Fermentas, Germany), using 1.2–1.5 µg of total RNA and random hexamer primer. Obtained single-stranded DNA was used for real-time polymerase chain reaction (PCR). Real-time PCR for mRNA expression of genes TNFa, IL6, Cxcl2, and GRO1. Sample volume was brought to 20 µL with deionized water. Amplification was performed on a 7500 Fast Real-Time PCR System. The amplification program consisted of initial AmpliTaq Gold DNA polymerase activation step at 95ºC for 10 min and the following 50 cycles: denaturation(95ºC for 15 s), annealing, and elongation (56ºC for 60 s). For control of specificity, we performed dissociation stage-sequential increase of temperature from 56 to 99ºC. The drop in the double-stranded DNA-SYBR Green complexe fluorescence strength was registered. We performed calculations using the 7500 Fast System SDS software provided. The CT (cycle threshold) is defined as the number of cycles required for the fluorescence signal toexceed the detection threshold. We calculated the expression of the target gene relative to the housekeeping gene as the difference between the threshold values of the two genes. The arrangement for measuring ventilatory and gas exchange parameters in rats included a one-way valved mask, a pneumotachograph for small laboratory animals with a pressure sensor (MPX5050), and a mass spectrometer (MH6202, Ukraine) . Signals from the pressure sensor and the mass spectrometer were processed by an analog-digital converter delivered to a computer and analyzed on the custom-written software. As was previously shown (27), the inertia of the mass spectrometer sensor does not affect measurement accuracy under respiratory rate lower than 150 breaths per min. Special calibration curves were used when the respiratory rate reached higher values. We measured respiratory frequency, tidal volume and calculated expired volume of ventilation per minute (V˙E). On the bases of expired O2 and CO2 curves we calculated V˙o2 and V˙co2. These data were expressed in mL/min/kg of body weight to BTPS (body temperature and pressure, saturated system) for respiratory volume and to STPD (standard temperature and pressure, dry system) for metabolic parameters. To exclude circadian metabolism oscillation influences on our results all measured parameters were compared to respective results from intact animals. Data are presented as percent in comparison with referent group. Morphometric analysis of the sections showed that in the group of animals treated with LPS there were disorders characteristic of an inflammatory process in the lung parenchyma. These included hemorrhages, some bronchiolar lumen were filled with cellular masses and exudates, peribronchial tissues were infiltrated with leukocytes with granuloma formation, Emphysematous manifestations were observed including enlarged alveoli, thickened inter alveolar septa due to interstitial edema and leukocyte infiltration, some being broken(Fig. 1). 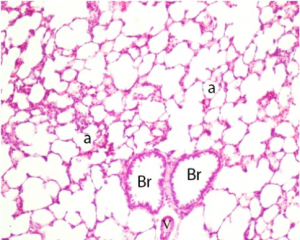 Figure 1 A, B and C. A – Normal lung tissue (x100) of rat from control group.B and C – Lung parenchyma after LPS injection (х 100). 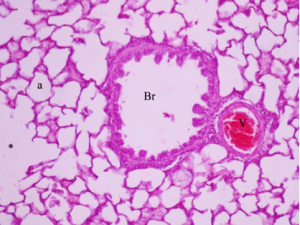 B – Pulmonaryhemorrhage: alveolar spaces containing red cells (↑). 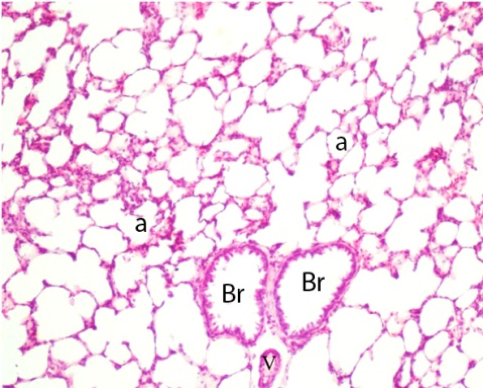 Individual bronchioles includeluminal cell masses. Interstitial edema of interalveolar septa: alveoli are filled with exudate and leukocyte components. C – Emphysematous changes of alveoli (*). [Bronchioles (Br), alveoli (a), vessels (V)]. The introduction of LPS significantly increased the relative volume of the alveoli compared with the control. Atelectasis in this group of animals was10.9%, hemorrhagic infiltration 3.8%, granulomas 1.2% relative to the total area of the tissue studied (Table 1). VL treatment of pneumonia significantly reduced lung tissue damage. Although there were some signs of inflammation in this group of animals (hemorrhage areas, leukocyte infiltration into inter-alveolar septa, and local alveolar enlargement(Figure 2)), morphometric analysis showed that the majority of indices returned to normal. The relative area of the sites with atelectasis and hemorrhage decreased to 2.1 and 0.97%, respectively (Table 1). Figure 2. Rat lung after LPS injection and VL treatment (x 100). 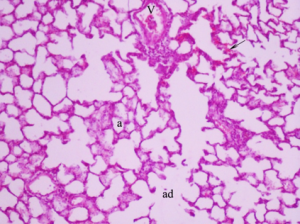 The lung parenchyma is not disturbed, except for minor infiltration of interalveolar septa and local alveolar dilations (ad), with some emphysematous features (*), as well as sparse hemorrhage areas (↑). 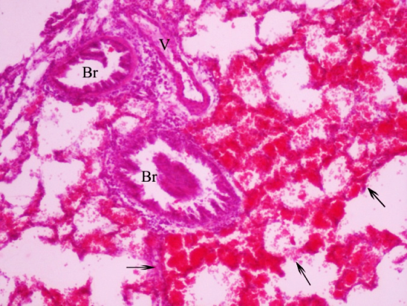 Br- bronchioles, V-vessels, a – alveoli. The alveolar volume was the same as in the control group. The area of the granulomas in VL treated pneumonia group (2.09%)was slightly increased in comparison with LPS pneumonia untreated group. Introduction of VL to intact animals did not lead to significant changes in the studied parameters. Nevertheless, in this group the relative area of sites with hemorrhages and granulomas was also slightly increased. LPS injection caused dramatic changes of all measured parameters in blood plasma.Imax, S and Iminwere all significantly increased compared to control. VLtreatment of LPS pneumonia resulted in significant reduction of all measured ChL parameters compared to the LPS group (Table 2). Table 2. Lucigenin-dependent zymosan-induced ChL of blood plasma. S and Imaxof lucigenin-dependent ChL reflects the level of O2–, generation , thus, VL treatment diminished LPS-induced O2–overproduction in blood plasma. Imin decrease indicates improvement of antioxidant capacity and oxidative stress resistance in the blood plasma with VL treatment of LPS-induced pneumonia . A similar enhancement of all ChL parameters was observed in whole blood (Table 3). Table 3. Luminol-dependent zymosan-induced ChL of whole blood. Under VL treatment S was significantly reduced, while Imax and Imin did not differ from the control. S of luminol-enhanced ChL reflects the total pool of ROS (O2–, •OH, H 2O2 and other peroxides) generation , thus, VL treatment diminished oxidative stress induced by LPS in whole blood. The dynamics of Imin suggest that VL does not yield a positive influence on antioxidant properties of whole blood. The most pronounced effects of LPS injection were observed in lung tissue homogenate, the site of the inflammatory process (Table 4). Table 4. 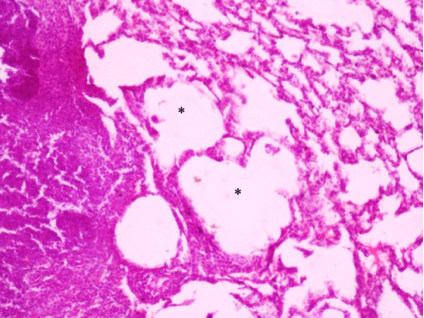 Lucigenin-dependent zymosan-induced ChL of lung tissue homogenate. S and Imax in lung tissue LPS group were increase to 498% and 270% respectively, Imin was increase to 244%. VL treatment led to some diminishment of S and Imax, 30.14% and 22.1% respectively, nevertheless these desirable changes were not significant. LPS injection caused increase ROS production in liver tissue homogenate (Table 5). Table 5. (Н2О2 + Fe2+) -induced ChL of liver tissue homogenate. S, Imax and Imin in lever were enhanced to 126.85,84.61 and 112.53% respectively compared to control. VL treatment significantly decreased S to 35.7%, which reflects diminished oxidative stress in lung tissue. VL treatment of intact animals caused significant increase in all measured ChL parameters in blood plasma, whole blood and in lung tissue homogenate. VL seems to enhance superoxide and other ROS production, which exhausts antioxidant reserves in blood and lung tissue. In contradistinction, significant increase of Imax in liver tissue homogenate combined with unchanged S and Imin. Imax reflects the level of hydro peroxide production . Our results suggest that increased hydro peroxide production is partially compensated by hepatocyte antioxidant activity, which is known to be very powerful compared to antioxidant activity in blood or lung tissue . No differences occurred in pro-inflammatory cytokines expression 3 days after LPS injection (Fig. 3).These expected results confirmed that the effect of LPS-induced cytokine expression enhancement was already passed . VL treatment caused significant diminishment of Il-6 and TNF-a expression compared to the LPS group. Development of pneumonia caused gradual decrease of oxygen consumption reaching minimum values at 24 and remaining at the same level at 48 and 72 hours after LPS injection in the LPS group (Fig. 4). The decrease of oxygen consumption was observed also in the VL-treated LPS group at 24 hours after injection, nevertheless, this parameter returned to control level at 48 and 72 hours. VL treatment of intact animals caused a gradual V˙O2 increase with maximum at 72 hours. This effect was accompanied with a V˙CO2 increase, suggesting more intensive carbohydrate and protein metabolism. The decrease in lung ventilation in the LPS group first appeared at 48 hours and then returned to control level at 72 hours after LPS injection (Figure 5). Introduction of VL to LPS injected rats caused a drop of V˙E at 24 hours after injection and then enhancement of this parameter at 48hours. Treatment of intact animals with VL led to significant growth of V˙E at 72 hours from the start of the experiment. Data suggest that VL has a therapeutic effect in the course of experimental pneumonia increasing oxygen consumption, lung ventilation and switching metabolism into carbohydrates and protein accumulation. VL treatment also led to enhancement of oxygen consumption in intact animals. The effect of VL is gradual, assumed due to the accumulation of active substances. We have shown that VL has antioxidant and anti-inflammatory effects in the course of experimental pneumonia. VL introduction to the LPS-injected animals protected lung tissue from lesions caused by induced inflammation. We observed diminished atelectasis, interstitial edema, and alveolar volume under VL treatment of pneumonia. These structural changes were accompanied with restoration of oxygen consumption and pulmonary ventilation which originally failed after LPS injection. We suggest that the mechanisms of VL therapeutic effects are connected with the antioxidant and anti-inflammatory properties of the components. VL treatment reduced LPS induced O2– overproduction in blood plasma, diminished oxidative stress in whole blood and liver tissue homogenate. The non-significant changes were only in lung tissue where inflammation was localized. Nevertheless, the decrease of TNF-a and IL6 expression in lung tissue homogenates suggest that the anti-inflammatory action of VL was also manifested in the lung. The majority of VL compounds contain flavonoids in high concentration, which are the potent ROS scavengers. The hypolipidemic effect of some components of VL, like Valeriana oficinalis  and Anethum graveolensL can also be involved in diminishment of blood ROS levels. The stimulation of oxygen consumption could be considered as an additional possible mechanism of VL therapeutic effect. Stimulation of mitochondrial enzymes is described for Potentilla anserine L. . Moreover, metabolic action of some medicinal plants should be synergistically additive, at least partially, with their antioxidant properties. Extract of Inula helenium increased mitochondrial membrane potential and ATP synthesis due to anti-radical activity . Increase of CO2 elimination suggests increased carbohydrate and protein utilization. Extracts of Inula helenium [23, 24], Recuitta chamomile ) and Liquorice  were reported to increase cellular glucose uptake. Stimulation of glucose uptake and mitochondrial enzyme ctivity both improve ATP synthesis and ameliorate recovery of inflamed tissue. The ambiguous effect of VL on intact animals captured our attention. On the one hand we did not observe pathological changes in lung tissue, except for an non-significant increase in granulomatous areas. No increase of cytokine production or inflammation was observed. We measured a stimulation in oxygen consumption. On the other hand, VL treatment of intact animals caused significant increase in all measured ChL parameters in blood plasma, whole blood and in lung tissue homogenates. In the liver this effect was less pronounced, presumably due to increased resistance of hepatocytes to oxidative stress. One possible explanation of such phenomena is the increased superoxide production by activated mitochondria. Another scenario is connected to the pro-oxidative action of some VL compounds. In addition anti-inflammatory properties of Tanacetum vulgare , Inula helenium L , Melissa officinalis , Artemisia vulgaris L  can all increase oxidative stress and induce mitochondrial-related apoptosis. These compounds have been traditionally used in anti-cancer therapy. VL manifested promising therapeutic effects in experimental pneumonia. Further research is needed to clarify the mechanisms of its action, the primary effectors in this multi-faceted compound and possible applications in medicine. VL manifested promising therapeutic effects in the course of experimental pneumonia. VL treatment of rats with pneumonia created positive changes in diminishing lung tissue injury, decreasing ROS generation in blood, lung and liver tissue, decreasing pro-inflammatory cytokine expression of TNF-α and Il-6 and improving oxygen consumption and carbon dioxide elimination. Results of VL treatment of intact animals was mixed: 1) positive – significant augmentation of V˙o2 and V˙e; 2) negative – significant augmentation of ROS production in lung tissue. Further research is needed to clarify the mechanisms of its action and the possible applications in clinical medicine. This research was funded by National Academy of Sciences of Ukraine. Tiberi S, Buchanan R, Caminero JA, Centis R , Arbex MA , Salazar M , Potter J, Migliori GB. The challenge of the new tuberculosis drugs.Presse Med. 2017 Mar;46(2 Pt 2):e41-e51. Sroka Z,Kuta I,Cisowski W, Dryś A. Antiradical activity of hydrolyzed and non-hydrolyzed extracts from Helichrysiin florescentia and its phenolic contents. Z Naturforsch C. 2004 May-Jun;59(5-6):363-7. Czinner E, Hagymási K, Blázovics A ,Kéry A, Szoke E, Lemberkovics E. The in vitro effect of Helichrysiflos on microsomal lipid peroxidation. J Ethnopharmacol.2001 Sep;77(1):31-5. Hu G, Liu J, Zhen YZ, Xu R, Qiao Y, Wei J, Tu P, Lin YJ. Rheinlysinate increases the median survival time of SAMP10 mice: protective role in the kidney. Acta Pharmacol Sin.2013 Apr;34(4):515-21. Miraj S, Alesaeidi S. A systematic review study of therapeutic effects of Matricaria recuitta chamomile (chamomile). Electron Physician. 2016 Sep 20;8(9):3024-3031. Ebrahim Abbasi Oshaghi, Iraj Khodadadi, Heidar Tavilani, and Mohammad Taghi Goodarzi, PhD Aqueous Extract of Anethum Graveolens L. has Potential Antioxidant and Antiglycation Effects Iran J Med Sci 2016 Jul; 41(4): 328–333. Kazemi M. Phenolic profile, antioxidant capacity and anti-inflammatory activity of Anethum graveolens L. essential oil. Nat Prod Res.2015;29(6):551-3. Setorki M,Rafieian-Kopaei M,Merikhi A,Heidarian E, Shahinfard N,Ansari R,Nasri H,Esmael N,BaradaranA. Suppressive impact of anethum graveolens consumption on biochemical risk factors of atherosclerosis in hypercholesterolemic rabbits. IntJPrevMed. 2013 Aug;4(8):889-95. Orhan IE, Senol FS, Ozturk N, Celik SA, Pulur A, KanY. Phytochemical contents and enzyme inhibitory and antioxidant properties of Anethum graveolens L. (dill) samples cultivated under organic and conventional agricultural conditions. Food ChemToxicol. 2013 Sep;59:96-103. Olteanu D, Baldea I, Clichici S , Bolfa P, Cenariu M, Schrepler-Perde M, Alupei M, Muresan A, Filip A. In vitro studies on the mechanisms involved in chemoprevention using Calluna vulgaris on vascular endothelial cells exposed to UVB. J Photochem Photobiol B. 2014 Jul 5;136:54-61. Konieczyński P. ELECTROCHEMICAL FINGERPRINT STUDIES OF SELECTED MEDICINAL PLANTS RICH IN FLAVONOIDS. Acta Pol Pharm.2015 Jul-Aug;72(4):655-61. Mazzio EA, Bauer D, Mendonca P, Taka E,Soliman KF. Natural product HTP screening for attenuation of cytokine-induced neutrophil chemo attractants (CINCs) and NO2- in LPS/IFNγ activated glioma cells. J Neuroimmunol. 2017 Jan 15;302:10-19. Gecibesler IH, Kocak A, Demirtas I. Biological activities, phenolic profiles and essential oil components ofTanacetum cilicicum (BOISS.) GRIERSON. Nat Prod Res.2016 Apr 8:1-6. Mathema VB, Koh YS, Thakuri BC, Sillanpää M. Parthenolide, a sesquiterpene lactone, expresses multiple anti-cancer and anti-inflammatory activities. Inflammation. 2012 Apr;35(2):560-5. Paduch R, Wiater A, Locatelli M, Pleszczyńska M, Tomczyk M Aqueous Extracts of SelectedPotentilla Species Modulate Biological Activity of Human Normal Colon Cells. Curr Drug Targets. 2015;16(13):1495-502. Sridharan S, Mohankumar K, Jeepipalli SP, Sankaramourthy D, Ronsard L, Subramanian K, Thamilarasan M, Raja K, Chandra VK, Sadras SR. Neuroprotective effect of Valeriana wallichii rhizome extract against the neurotoxin MPTP in C57BL/6 mice. 2015 Dec;51:172-83. Park HH,Kim SG, Park YN,Lee J, Lee YJ, Park NY,Jeong KT, Lee E Suppressive effects of britanin, a sesquiterpene compound isolated from Inulaeflos, on mast cell-mediated inflammatory responses. Am J Chin Med. 2014;42(4):935-47. Zang X, Fan C,Xiao Y,Mao X. Anti-inflammatory and antiosteoclastogenic activities of parthenolide on human periodontal ligament cells in vitro. Evid Based Complement Alternat Med. 2014;2014:546097. Simmler C, Pauli GF, Chen SN. Phytochemistry and biological properties of glabridin. Fitoterapia. 2013 Oct;90:160-84. Shakeri A, Sahebkar A, Javadi B. Melissa officinalisL. – A review of its traditional uses, phytochemistry and pharmacology. J Ethnopharmacol. 2016 Jul 21;188:204-28. Qu J, Zhang J, Pan J, He L, Ou Z, Zhang X, Chen X. Endotoxintlerance inhibits lipopolysaccharide-initiated acute pulmonary inflammation and lung injury in rats by the mechanism of nuclear factor-kappaB. Scand J Immunol. 2003 Dec;58(6):613-9. Brauer RB, Gegenfurtner C, Neumann B, Stadler M, Heidecke CD, Holzmann B. Endotoxin-induced lung inflammation is independent of the complement membrane attack complex. Infect Immun. 2000 Mar;68(3):1626-32. Demiralay R, Gürsan N, Erdem H Regulation of sepsis-induced apoptosis of pulmonary cells by posttreatment of erdosteine and N-aceylcysteine. Toxicology. 2006 Dec 7;228(2-3):151-61. Elder AC, Gelein R, Azadniv M, Frampton M, Finkelstein J, Oberdörster G Systemic effects of inhaled ultrafine particles in two compromised, aged rat strains. Inhal Toxicol. 2004 Jun;16(6-7):461-71. Lancaster LH, Christman JW, Blackwell TR, Koay MA, Blackwell TS Suppression of lung inflammation in rats by prevention of NF-kappaB activation in the liver. 2001 Feb;25(1):25-31. Goldstein S, Meyerstein D, Czapski G (1993) The Fenton reagents. Free Rad Biol Med 15:435-445. Pozharov VP Automatic installation for measuring the volume-time parameters of external respiration and gas exchange in small laboratory animals. 1989 Jul-Aug;35(4):119-21. Žilinskas J, Žekonis J, Žekonis G, Šadzevičienė R, SapragonienėM, NavickaitėJ, BarzdžiukaitėI. Inhibition of peripheral blood neutrophil oxidative burst in periodontitis patients with a homeopathic medication Traumeel S. MedSciMonit. 2011; 17(5): CR284–CR291. Antonini JM, Van Dyke K, Ye Z, Di Matteo M, Reasor MJ. Introduction of luminol-dependent chemiluminescence as a method to study silica inflammation in the tissue and phagocytic cells of rat lung.Environ Health Perspect. 1994,102 Suppl 10:37-42. Piskarev IM, Trofimova SV, Burkhina OE, Ivanova IP Investigation of Free Radical Processes in Substrates and Biological Samples by Means of induced Chemiluminescence 2015;60(3):496-505. Zhu J, Xu K, Zhang X, Cao J, Jia Z, Yang R, Ma C, Chen C, Zhang T, Yan Z. Studies on the regulation of lipidmetabolism and its mechanism of the iridoids rich fraction in Valerianajatamansi Jones. BiomedPharmacother.2016 Dec;84:1891-1898. Goodarzi MT, Khodadadi I, Tavilani H, Abbasi Oshaghi E The Role ofAnethum graveolens L. (Dill) in the Management of Diabetes. J Trop Med.2016;2016:1098916. Wang J,Zhao YM,Zhang B,Guo CY.Protective Effect of Total Phenolic Compounds fromInula helenium on Hydrogen Peroxide-induced Oxidative Stress in SH-SY5Y Cells. Indian J Pharm Sci.2015 Mar-Apr;77(2):163-9. Negrín G, Rubio S, Marrero MT, Quintana J, Eiroa JL, Triana J, Estévez F. The eudesmanolidetanapsin fromTanacetum oshanahanii and its acetate induce cell death in human tumor cells through a mechanism dependent on reactive oxygen species. Phytomedicine. 2015 Mar 15;22(3):385-93. Du Y, Gong J, Tian X, Yan X, Guo T, Huang M, Zhang B, Hu X, Liu H, Wang Y, Li J, Li M.Japonicone A inhibits the growth of non-small cell lung cancer cells via mitochondria-mediated pathways.Tumour Biol. 2015 Sep;36(10):7473-82. Alesaeidi S, Miraj S. A Systematic Review of Anti-malarial Properties, Immunosuppressive Properties, Anti-inflammatory Properties, and Anti-cancer Properties ofArtemisia Electron Physician.2016 Oct 25;8(10):3150-3155.